I also found that if you go from a BARF diet (Bones And Raw Foods) to supplementing with dry dog food (even the best) it can cause itching. I added Blue Buffalo dog food and Laine started knawing at her right paw. I thought she has something stuck in there and took her to the vet who informed me it was a diet issue. Anyone have feedback on either Blue Buffalo or WolfCub? Oh yeah...Laine LOVES Salmon and Lamb. My husband says the dogs eat better than we do....Well, of course...Duh. For Puppy food there is a nine page article listing main ingredients and nutritional breakdowns (so that you can compare foods), it is in the 2007 Annual Dogs*USA Purebred Puppy Buyers Guide and Owner's Manual Mag. There is also a great article on posionious plants. Oh my! I am very new both here to this forum AND having a mastiff puppy. 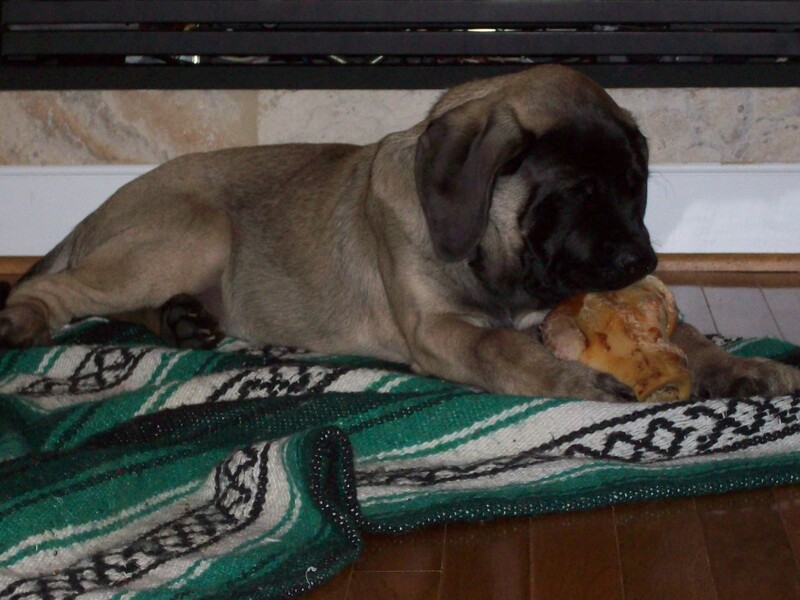 I did have an Italian Mastiff, but got him when he was a yr old. He died 2 mos ago. Anyway....I have been reading all the posts on good foods and diets....wow! Most of the foods talked about I have never heard of. I know the local pet stores and vet clinics don't have them. Not sure if maybe feed stores would. I am feeding my pup a combination of innova puppy, evo adult, and puppy plate canned. I'm going to start adding some chicken and various other types of raw necks and a little juiced fruits and veggies. He was only being fed a raw egg, whole milk, and infant cereal when I got him and was very "sunken in" and boney. I have been feeding the combination of foods for a couple days now, and he is now growing noticeably, filling out, playing, and appears much much more healthy in just the couple of days. When I got him he had diareah, and has kind of loose stools now, so I guess that is improving too. I've heard both good and bad about this food. Basically the bad I have heard is the protein content. The innova puppy food has only half the protein content of the evo dog food, but I have also read mostly that puppy food is not good for this breed. Very confusing, yes? lol Since he really needed weight badly and loves this combination, for now I guess I'll stick with it. I couldn't get him to eat anything else, and he won't eat just one of these by itself. Especially without the puppy plate canned part in it. I'm a newbie and trying to learn and do whats best for my little boy, who looking at him today, is really starting to grow visibly since he's been eating. I don't think anyone saw your post with questions on what to feed. Please ask Linda. Please contact Linda and she can tell you what to feed. Hi, we use Eagle Pack Holistic large and giant breed puppy and adult. Different dogs. I have noticed since we switched the older one to that 6-8 months ago, he sheds less,much less gas, poops less, his coat feels and looks good and he eats less of it. We've been very happy with it. The puppy is going through a slow switch to it and seems to be adjusting great. We did use Iams large breed puppy cuz that is what the breeder used but my guy built up allergies to it. Got some blood work done to see what it was cuz hair was falling out and had hives real bad. Use Purina LA from the vet but got way to expensive so had to do a lot of label reading at the pet store. I now use Nutro Natural Receipts large breed puppy lamb & rice, George is doing real well on it so I think we found a keeper. does anyone have any experience with this kind? Hi , I have a 4 year old male i just adopted and he is way to skinny i mean u can see his ribs!!!!!!!!!!!!!!!!!!! !what kind of dog food do u suggest i feed him. Eagle Pack Power Formula - 30% protein, 20% fat. It puts weight on thin dogs very well..
HI I have been feeding Isaac and Sophie Blue Buffalo Lamb and Rice which is a no soy, corn or wheat product. I originally started using this as Isaac was having allergy problems with his feet and eyes. Unfortunately the allergy is grass/pollen related but his fur is so very soft and shiny and he has a lot of muscle tone to him. So I decided to keep them on it. Sophie is a 4 month old puppy and she is very lean and muscular, soft and shiny. The thing I like best is the smell, when you open the bag it smells like lamb and both dogs come running. They really like this food alot and will eat it plain. Of course a little something extra always makes it taste better. I just joined the board and was just wondering about food. I just got 2 mastiff puppies that are 3 months old. Since they have started eating dog food, they have ate Ol' Roy. I know this isn't a good food so I want to switch them over asap to another food. I have read that eagle pack holistic is very good food. Do I feed them the large/giant breed puppy food for a year or do I switch them over before then to the adult food? I have been using pro plan giant breed puppy food. My puppy is 6 1/2 months and seems to be doing well on this food. Is this a good food for my mastiff ? The food is formulated for Giant breeds puppies, how long can she stay on it. When should I switch to pro plan adult giant breed food? Is there a better food for my puppy. Yes, I feed raw to all of my dogs (Frenchie, Neo and now the Mastiff puppy) and I know many others here do, as well. No, no issues. Their poops are small and inoffensive, their coats are nice and shiny and they are, overall, healthy. Never had one get sick from raw but they did get sick on chicken jerky treats from BJ's. That was nasty. Now they only get homemade cookies. Not commenting on the actual brand of food, but a friend of mine that her mom bred and showed Great Danes her whole childhood and they were champion lines kept coming up with litters of puppys that were healthy and would end up mamed in the legs she said, she didn't know what the technical term was but after going to specialists etc it all turned out to be because of to high of protein and when they switched to adult dog food on puppys after that she said they never had a puppy do that again. As to who has fed raw, I have fed raw to all my mastiffs, and also to my other breeds over the years, eng,bulldogs, neos, and rotties, they do recieve one cup of dry with their food as well each day. But I do add some additives as well to balance. I do love the natural in the wild feeding. We just rescued a brindle male mastiff from the pound. He is only 103lbs and seems really scrawny through the middle. We started him on Iams large breed chow, but he won't eat it. We have tried adding canned food and it hasn't helped. We added 9 oz raw staek to his food this am and he spit the raw steak out. When I cooked the steak he ate it! He is having loose stools as well. My question is how much food should we be feeding? We are likely going to switch to Eaglepack given the great comments here. Can he just eat dry food? Will he? The vet said dry food was better for his teeth, but he doesn't seem to want it. We have been adding some water to his food and that seems to help. Do you know why he is in the pound? My first mastiff was a rescue. He was so sad when I got him he cried all the time real tears, and would not eat. His owner died in a car crash. Some dogs have a hard time with change. Also, some dogs have meal time routines. Fosdick had to have a hug before eating or he wouldn't touch his food. Was he eating at the pound? If so what were they feeding. Also, I had to hand feed for a while with him. Could you please post this on the board, I have no dout that someone out there has good ideas about rescued dogs. I'm really confused about the whole raw thing. When I added the raw london broil, Cooley took a bite and actually spit out the raw pieces in it. He really seemed to like it when I cooked the london broil and put it with his kibble. I think he is attached more to my husband and seems to eat better for him. He is really only eating one meal a day well. That is a good observation, Fosdick only like females. Your dog may have been a man's dog. Sophie will not eat raw. There are pro's and con's to it. I think it depends on the dog, and the home he is in. For me raw would be impossible because of where I live. And Sophie free feeds so it just wouldn't work. To me it is what ever works for you and your dog is the best. Fosdick lived for 14 1/2 years on dry dog food only, and was a very happy healthy dog. ...adding some water to his food and that seems to help. The first thing that comes to mind when I read this is...have his teeth been checked? When you add water is it making the kibble soft? How much is he eating a day now? The more info that you can post the better! We have only had Cooley for a couple of days and are just trying to figure him out. The pound said he was found playing outisde with kids. When they went in he parked himself on someone's porch and wouldn't leave. He was adopted out as a guard dog, but that didn't work out. Spend 5 minutes with this dog and you can see he is just a lovebug. He is so happy to be here and just really gentle. He seems happier this past few days. The vet thought he was between 2-3 years old, but who knows??? She looked at his teeth and said there was more tartar on them than she would expect for a puppy. We have been waiting to de-worm him thinking that may be part of his diarrhea, but wanted him to be eating more consistently first. I guess he is eating about 4-6 cups of food a day total. You need to have him wormed if he has them ASAP. That will keep him skinny and unhealthy. It will cause loose stools. Eating several small meals is better for him. But if he has only been eating one meal aday most his life it may take awhile to change him. Any Good quality food should be good. Eagle pack is great. I use Nutro Natures choice. But just make sure its a good quality food. Dry is better for his teeth and if they have a lot of tarter he may have been feed canned or soft food. Get his teeth cleaned. You can add water but I would slowing cut back and ween him from it. I feed only dry. Unless I have a pregnant girl then she gets all kinds of extra goodies. Get him some big bones to chew on it will help strengthen his teeth and help clean them. Anyone feed kibble and cooked meats? I have been feeding Merrick Puppy Plate kibble, supplemented with nupro joint formula, mixed with various Merrick and Evangers canned products. Over the holiday's the company I buy from was on vacation and I ran short of cans. I stared feeding rotiserie chicken, cooked hamburger, chicken livers, etc. and discovered that it is much cheaper than super premium canned foods. I currently mix in 1 cup of chicken 4 days a week, 2 days of beef and 1 day of canned mackrel. The nupro makes a nice gravy for them. I feed that way all the time. Eagle Pack and cooked meat. Mary, Your dog always looks so nice in his pictures. Can I ask what meats you add and how much? Sue I give Cole what ever we eat. If we have Chicken he gets that, beef, pork, sometimes canned tuna , I boil up the chicken parts that come with the chicken and cut and de-bone everything. I even give ham once in a while too salty for both of us. Sounds similar to what I am doing except I have 4 dogs and I'm not a big fan of cooking. We eat out alot or grab whatever is handy. I cook for the dogs more than I do for the family. Although now if I do make a roast beef or pork roast I make a few lbs extra for the dogs. I read fish is good to feed once a week so added the canned mackrel to the routine, and add some chicken livers to the rotisserie chickens, but wonder if there is any other foods that I also would not consider people food that would be good to add? I get the whole turkeys when on sale and cook one up. There is plenty of meat for a while. There is only my husband and myself now so I always have leftovers. Believe it or not french style green beans are good, and cooked carrots , I even chop up a hot dog and add that. Not often though also because of the salt. My Luka was eating IAMS Large Breed (NOT puppy food - too much protein) because that's what the breeder fed him- but after reading this thread - I switched him to Eagle Pack Holistic Select Large Breed in the orange/peach bag - he LOVES the taste much better than the IAMS and his gas (which was 'house clearing horrible' before) is almost completely gone and his stools are a better consistency and smaller. We've just gotten him over to 100% Eagle Pack (added it gradually) - so far so good. I'm always amazed at what people feed their dogs. When I was in the Navy I trained bomb and patrol dogs, we fed our dogs a Mil Spec dry dog food called MSD (Multiple Stress Diet), this was simply a high protein, vitamin kibble; unfortunately, it had other ingredients that kept the dogs wired; thus, working life of the dog was about seven years max, I don't know what the Navy feeds its Military Working Dogs now. 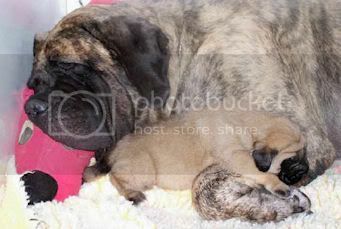 I feed our Mastiff Puppy dry Blue Buffalo large breed puppy food, expensive but worth every penny. Hi Maddiejames, now this is a controversial subject so, for what it’s worth, here is my opinion. Your Pup is very smart, he knows if he holds out he’s going to get the tasty stuff so, you have two choices: either you can prepare his food using one of the myriad raw holistic natural puppy food recipes you can find on the net or, you can show some tough love by placing his dry kibble before him at the same time each day, if it’s not gone in 15 minutes remove it (throw away what he did not eat) and do not feed him a thing (no treats) until the next feeding time and repeat the process until he starts eating, IF your puppy is a sound healthy animal he will be eating all of his dry kibble as soon has he’s hungry enough. The keys are: always feed your pup at the same times each day, always remove and discard what he does not eat in fifteen minutes and nothing to eat between meals. Good Luck. you are going to get lots of opinions on this so you have to do what is right for your pup. I feed Cole Eagle Pack (peach color bag) and always mix it with something yummy. He gets whatever we eat on his food. I chop up chicken, beef , canned tuna, and yogurt, . Do not go overboard just enough to keep him interested. JMO. Enjoy the animated BALANCED DIET accompanied with sound ! That cartoon pooch was too cute! Sampson is spoiled just like my gang. Each one of mine would turn its nose up at dry kibble, and really can you blame them? I admit, I did spoil mine, no tough love around here. Food should be more than just nutrition, it should be enjoyable. I use a lot of Merrick and evanger canned food, canned mackrel once a week, and sometimes just left over people food or publix chicken. I also use Nupro supplement that when mixed with water makes a gravy the gang seems to really love. Also, wondering if anyone has tried Taste of the Wild by Diamond? It's grain free. My friend is a vet who has done some extra work in nutrition and she is a big fan of raw feeding, which just won't work around here, so she says grain free is the next best thing. Any opinions? I’ve seen some amazing things in my day, but this takes the prize. I recently found this supplement & cannot believe what I have seen. I honesty believe it is the best nutritional supplement on the market. P For younger dogs (under 2 years old), it strengthens their immune system, as well as building and strengthening the cardiovascular, skeletal and nerve systems. P For dogs in their prime (age 2-8), it improves the condition of their skin and coat while helping protect against allergies, skin and coat problems, hot spots, staining from tears, digestive problems and more. P For older dogs (over 8 years old), it helps reduce and eliminate arthritis, tumors, premature aging, cataracts, heart conditions, diabetes and many types of cancer, and extends the life and improves the vitality of many dogs. For your convenience, you may order directly from the manufacturer (at up to 50% off what vets charge) by calling 800-474-7044 and using Order Code: 72793 or go online to http://www.nuvet.com/72793 Also, take advantage of an additional 15% savings by going on auto ship. Cole has been on Eagle Pack Holistic(peach color bag) since he came home and he has done fine one it. He is now 2 yrs old. I have a chance to order the food from Europe and bring it to the remote part of Africa I am in ;-)) Can you please advise which is the best brand I could get for my 10 months old in Europe? Considering that I will be bringing the stock for at least 6 months, shall I order different types, say for puppies and juniors? I am feeding him Eukanuba for big breed puppies and he loves it but maybe it's time to get something else. Check the protein levels in Eukenuba for puppies under 1 year old I think it has too much protein for the mastiffs. I started both my puppies on raw at 17 weeks. Starting slowly with integration and deletion... experienced a short and positive transition. That is all they ate until Sable (7 years old) came into the house. The pups are 9 & 8 months old. Never having an older dog to change over, I was reluctant. So I kept Sable on her regular diet. The pups started going for her food and she for theirs. So I put them all on dry food as Sable adjusted to us. I got to tell you, I have never seen as much poop come out of my pups as they are pushing out on kibble. I am using quality food and I am cutting different foods to make a formula. PS: Baby still grabs a fish out of the ocean when we are at the beach... she proudly prances up the two blocks home with her catch in her mouth, brings it home and eats the whole thing... Never had a problem. I am still confused about how much to feed our mastiff. He is 100 - 125 lbs and he was a rescue so guessing 1-2 years old. We started him on Iams large breed and were feeding him 6 cups in the morning. He acted like we were starving him. So we started feeding him 5 cups in the morning and 4-5 cups at night. He seemed happier and filled out some. I know the size of the dog, age and what food all influence how much they should eat... What would the range be for a 1-3 yr old male dog that's about 120 lbs be? He seems happier at 10 cups/day better than 6 cups per day, but the pooping and gas are awful! !